It’s that time of year again when many industries open the nominations for their awards, but it can be a daunting process. I’ve been there in the past, staring at the long list of questions and struggling to know where to start. Award entries are a difficult beast to write. You know your business inside out, but it’s tricky to get that down on paper for someone else to understand and for many of us it’s hard to boast about ourselves and successes. However, submitting a nomination is a great thing to do. From a business perspective, it can help raise the profile of your company and increase awareness of your products or services. From a personal point of view, it helps you reflect on all the hard work and success that you’ve had over the year. It’s also a marvellous way to show everyone who’s helped in that success how much you appreciate them. Over the last 12 years I’ve written many awards applications for national, local, community and industry awards. After recently speaking with a few small businesses, I want to help more companies put themselves forward. I’ve written this guide to help highlight some key areas you need to think about when creating your award application and hopefully give you the confidence to shout about your business. Have you provided excellent customer service this year? Have you contributed to your wider industry in any way this year? Do you produce the best cakes around???? Is this something my company has really excelled in over the last year? Is this an aspect of my company I’d like more people to know about? Do I fulfil the criteria set out by the judges? If you have answered yes to all these questions, then it’s the right award for you. Looking at the questions and criteria set out by the judges is a way of finding out what they are looking for in an ideal winner. Your mission (if you choose to accept it) is to prove to them that at you fulfil their criteria and that you have done it successfully. Find examples from your business to meet each point and use these in your application to provide evidence to the judges. For some this will be difficult, for others easier, but the most important thing to remember when actually writing your entry is that you need to look at your company from the outside. Try to avoid using internal jargon or names for things as the judges won’t know what you’re describing. I find it helpful to imagine I’m describing my business to a new client who doesn’t have any prior knowledge of who I am or my company. The word limits are there for a reason and often if you have gone over then you are not being concise enough. If you’ve not reached the word limit you may be lacking some details that could help your entry. Try to keep as close to the word limit as possible to keep your application on track. Once you’ve written your entry make sure that you read through it again to check for any spelling or grammar typos. The award entry is a representation of your company, so you want to make sure it is perfect. Also sit back and ask yourself – does this explain what my company does? And is it obvious from my answers what award I would like to be nominated for? I find it really helpful to ask a friend or family member to read through award entries. This will pick up any hidden mistakes that have been missed. It will also highlight anything that doesn’t make sense to someone from outside your company. Finally, it’s important to support your entry with other documentation. Some awards will specifically ask you to provide certain documents, but it’s always a good idea to include an image of your product (if it’s a product award) or a company brochure. This will help the judges to really understand your business and improve your chances of a nomination. 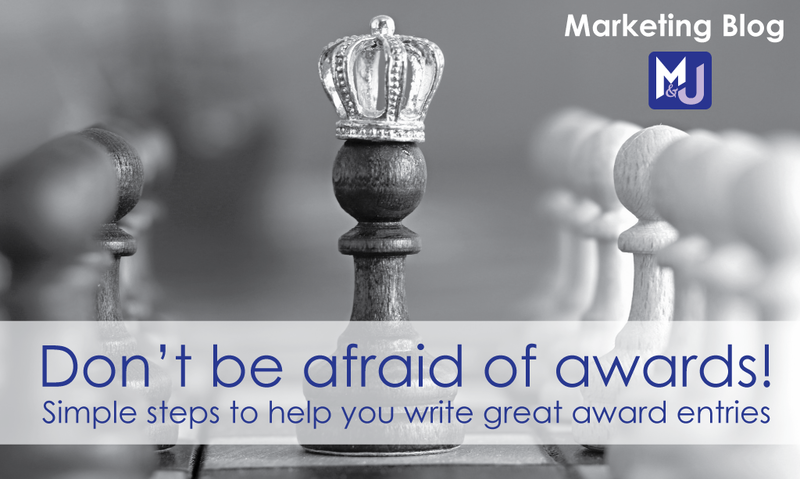 I hope that these tips will help you feel more confident about writing your award entries and give you a good starting point. If you are struggling and need some extra support, you can email me at ruth@martinandjonesmarketing.co.uk and we’ll get you off the ground. Good luck with all your entries and here’s to celebrating your successes! Found this blog helpful? Please share it with your colleagues and sign up to our blog to get them direct to your inbox once a month.